At the Sunglow Cafe, you are likely to be welcomed and waited on by Saidee (left) or her mom, Misty (center), while Saidee’s dad, Brian, serves as manager and cook. Photos by Sharon Spaulding. Amble into the Sunglow Café in Bicknell (pop. 322), and you’ll think you’ve walked onto a movie set and into a world both familiar, but different. At the Sunglow Cafe, mustard colored walls echo the sandstone outside, while teal painted arrows reminiscent of Native American symbols point to a mantra the locals know so well. Mustard colored walls echo the sandstone outside. Large, teal painted arrows on the walls are reminiscent of ancient Native American symbols seeming to guide you on the path to wisdom. Inside this modern day Kiva a few miles outside of Torrey, these arrows point to a different sort of mantra written just inside the front door: Enjoy life. Eat Pie. Though baseball caps have replaced cowboy hats, Levis still seem to fit just right over the mostly long, lean frames of men who sit as comfortably in a saddle as they do in an easy chair. Chances are you’ll be welcomed by Sadiee or her mom, Misty. Brian, Sadiee’s dad and Sunglow’s cook, flips burgers, eggs, and pancakes on the griddle. At the Sunglow Café you can order steak and eggs for breakfast, steak and salad for lunch, or steak and potatoes for dinner. Bicknell is still cattle country. For $1.99, you can have chocolate milk. The menu is as long and deep as the famous red rock canyons nearby. 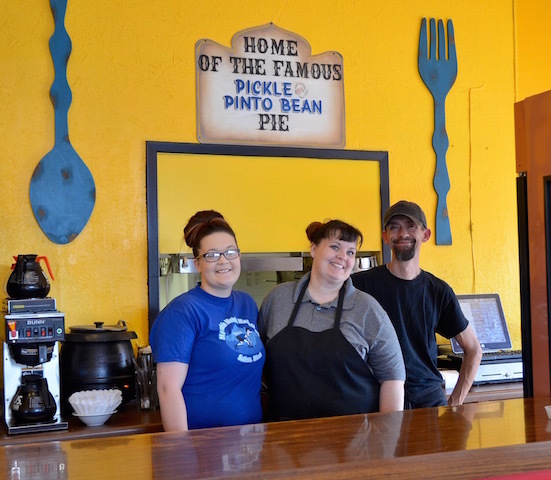 But while people come in for good food at honest prices, curiosity seekers come to taste the fruit of knowledge: the Pickle and Pinto Bean pies. Yes, you read correctly, the Pickle and Pinto Bean pies have made the Sunglow somewhat famous. They were the creation of Cula Ekker, who was once known as the “Pie Queen” of Wayne County. No one knows the exact origin of Cula’s creations, but, says Brian, they date to the Depression when people simply had to make do with what they had and everything was made from scratch. Cula’s brother, Milton Taft, says he and his sister were two of six siblings who grew up nearby on a farm. When Cula was just nine years-old, a brother was injured in a riding accident and spent most of a year in a hospital in Salt Lake City. Their mom went with him, leaving Cula to handle the cooking for the family and the farm hands. 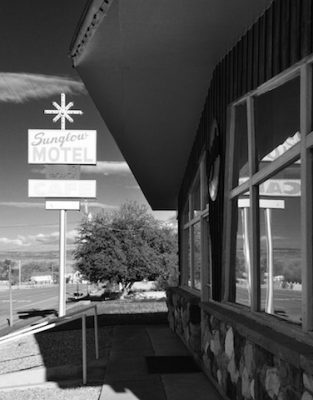 When Milton built the Sunglow motel in 1965, along with the restaurant, Cula signed on as chef and began serving up her famous Pickle Pie. According to Brian, legend has it that one day two bikers were passing through and one had a recipe for Pinto Bean pie. He and Cula swapped their secret formulas. No one knows what became of the biker, but Cula added the pinto bean to her menu. Cula passed away a few years ago, but not before sharing her recipes with Bessie Stewart, who has worked at the Sunglow for 31 years. Also born and raised in Wayne County, Bessie comes in at 5 a.m. to make up about 14 fresh pies, and she still makes the soup noodles from scratch. Last November, she baked over 300 pies to fill Thanksgiving orders. In addition to continuing Cula’s legacy, Bessie is locally and affectionately known as the “pistol-packing pastry chef.” She once unloaded the barrel of a .22, firing at her husband as he tried to disappear into the darkness of a desert night. “The Lord was with him,” she laughs. “We were both so angry. When I picked up that gun, he knew I meant business and took off running. It was so dark I couldn’t see, so I fired at the sounds he made as he ran. It took a few years before we could laugh about it,” she says, “but eventually we made up.” Today, she has four kids, 15 grandchildren, and 15 great-grandchildren. Her husband passed away several years ago. In addition to Pickle and Pinto Bean, the Sunglow serves up Buttermilk and Oatmeal pies along with the more traditional Apple, Pecan, and Blueberry. Whole pies are $9.95 and a single slice is $3.49. In addition to its famous Pickle and Pinto Bean pies, pastry chef Bessie Stewart makes up traditional varieties almost daily. Everything is made fresh. 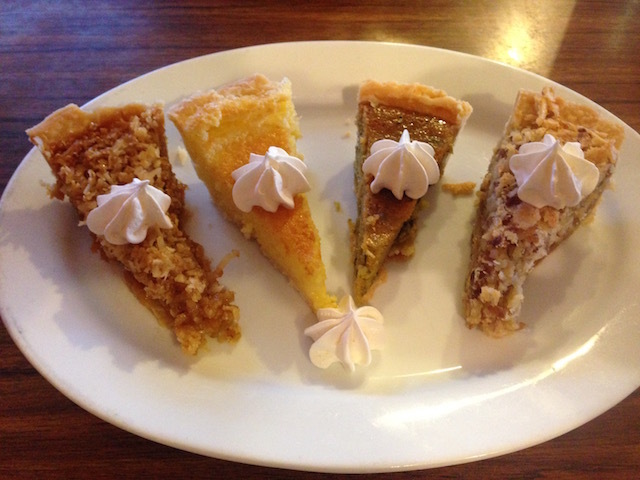 If you can’t decide, try the Sampler – Oatmeal, Buttermilk, Pickle, and Pinto Bean. Pickle Pie has a sweet but tangy taste you might savor on a summer’s day, while the Pinto Bean, coconut mashed with the beans, has a hearty, stick-to-your-ribs kind of pie. Whoever painted those four words on the wall was truly wise: Enjoy Life. Eat Pie. At least at the Sunglow Café. In a mixing bowl, sift flour and salt. With pastry blender or two knives, cut in lard until mixture resembles coarse crumbs. Whisk together water, vinegar, and eggs until thoroughly mixed. Sprinkle liquid, 1 tablespoon at a time, into flour mixture, stirring lightly with a fork after each addition until the pastry is just moist enough to hold together. Shape pastry into a ball. Roll out as desired.